A rail investigation has found a broken axle caused a high speed train to derail in Leicestershire. Services were disrupted for four days after the East Midlands Trains London to Sheffield service derailed near Market Harborough on 20 February. The Rail Accident Investigation Branch (RAIB) said it would now focus on what caused the axle to break. The RAIB report said the train was travelling at about 100 mph (160 km/h) at the time. 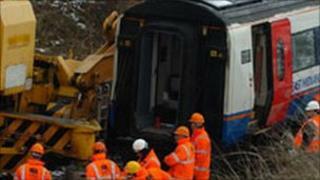 Although the train remained upright, significant damage was caused to the track and signalling equipment, the RAIB said. The report said: "The investigation has found no evidence that axle fatigue initiated the failure. "Currently, the focus of the investigation is on a gearbox output bearing, underneath which the axle fractured. "The inner ring of this bearing had rotated on the axle and it is thought that this slipping at the inner ring/axle interface gave rise to very high temperatures. "This was sufficient to weaken the axle to the extent that it was no longer able to carry its normal loads." East Midlands Trains (EMT) officials said safety checks were carried out on the rest of their fleet following the incident.